Insulation is used to either contain heat for maintaining warmth, or to resist heat for maintaining cooler temperatures. In many applications, radiation is the dominant mode of heat transfer. RadiantGUARD® Reflex-Air™ reflective bubble insulation is considerably more effective than conventional insulation, such as fiberglass or cellulose, in reducing radiant heat transfer. Our bubble insulation reflects up to 94% of radiant energy in addition to resisting conductive and convective heat transfers thus providing the most effective insulation benefits. 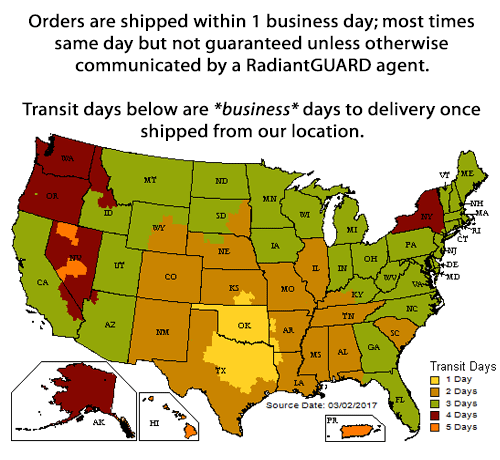 RadiantGUARD bubble insulation products are industrialized, not basic bubble wrap packaging, that are manufactured to last and maintain the enclosed air space. The independently enclosed bubble insulation layers are sealed with multiple layers of polyester creating closed air bubbles which prevent the loss of air over time. These air bubbles keep warmer moist air from coming in contact with cooler drier air thereby reducing condensation that is common in metal buildings and agricultural barns. Our Reflex-Air single bubble and double bubble insulation is readily available in 16", 24" and 48" widths and custom order widths in larger sizes. Our bubble insulation comes in both a double-sided aluminum version, as well as a version covered with aluminum on one side and white polyethylene on the other. RadiantGUARD bubble insulation will withstand temperatures between -60 degrees Fahrenheit and 180 degrees Fahrenheit, making it ideal for both metal building and flooring installations.